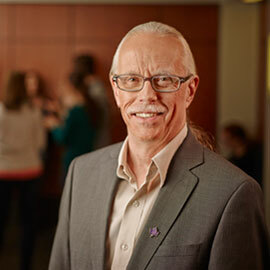 Wilfrid Laurier University congratulates Glen Carruthers, dean of the Faculty of Music, for his recent appointment as an honorary lifetime member of the Canadian University Music Society. The honour recognizes his contributions to post-secondary music education in Canada. During its annual conferences, the Canadian University Music Society (MusCan) brings together artists, music scholars, and members of various cultural organizations to exchange views and ideas about contemporary issues affecting music in Canada. Carruthers has attended the MusCan conference for over 35 years, holding positions with their Board of Directors, standing committee of institutional members, and as their vice-president and president. Carruthers has been dean of Laurier’s Faculty of Music since 2010 and is known at the university for his commitment to his students and for bringing innovative programming and outreach opportunities to the Faculty of Music, including the National Youth Orchestra of Canada’s residency, the Laurier Conservatory and Kitchener-Waterloo Symphony Orchestra concert collaborations.